Osteojuv Review – Is This Product Safe To Use? What are the Ingredients Used in Osteojuv? Hyaluronic Acid – Hyaluronic Acid also referred in short as HA is present naturally within your joint fluid. HA has an important role in joint cushioning and lubrication. Scientists have for years introduced HA into knee joints to provide instant relief. OsteoJuv has offered an alternative and equally effective, but more convenient way, to deliver HA benefits to your ailing joints through an oral supplement. HA is known to reduce joint inflammation, promote joint lubrication and block tissues that damage body enzymes. Chondroitin Sulfate – Chondroitin sulfate is often used in combination with Glucosamine. It is an organic matter mostly found around the connective tissues of our bodies. Chondroitin sulfate is scientifically a complex carbohydrate that aides connective tissues to hold water. Due to this quality, Chondroitin sulfate slows down the joint space degeneration and support cartilage formation. White Willow Bark – This extract has been used by ancient Chinese due to its medicinal characteristics for centuries now. The Chinese took advantage of the soothing effects of Salicin, the active ingredient in White Willow Bark. Salicin contains salicylic acid, the chemical that gives aspirin its pain soothing qualities. In OsteoJuv, White willow bark is believed to diminish and rehabilitate pain caused by symptoms of arthritis. It also provides relief from headache, chronic pain, muscle aches, back and neck pain, and menstrual cramps. When you combine the healing benefits of white willow bark with the pain soothing ability of salicylic acid, you reduce the levels of prostaglandins in our bodies. Prostaglandins are responsible for causing, pain and inflammation in the body. Glucosamine – Glucosamine is a natural product that is naturally harvested from the skeleton of Shellfish. There are several forms of glucosamine with each type exhibiting different molecular masses meaning they may have slightly different turnaround time and side effects if any. Glucosamine has been used to fight joint pains when combined with chondroitin and the reason you will find a combination of these two ingredients in many of the joint care products in the market. Glucosamine HCL is an amino glucose produced by the body. It plays an important role in fibrous and other ligament formation and thus it is essential for proper joint development. OsteoJuv takes a rehabilitative approach in dealing with joint pains. First, it promotes joint lubrication with the help of HA thereby allowing movement. Joint lubrication also prevents the wear and tear caused by friction. Dry joints are also known to cause over half of joint pain related cases. OsteoJuv joint supplement precludes events that damage our joints by providing enough lubrication; which then soothes pain, joint stiffness, and improves flexibility. What are the Pros of Osteojuv? What are the Cons of Osteojuv? 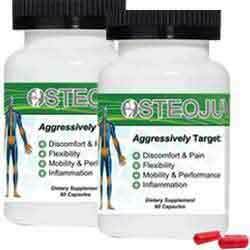 Osteojuv is a long term use supplement. Its effectiveness can only be determined over a long period, and it might run into several weeks. Is Osteojuv Right For You? Osteojuv looks compelling on paper but practically, the product has exhibited contradicting results. There is only one sure way to find out if the product works-to try it. It may or may not work. Osteojuv can be used by any adult who is not pregnant, breastfeeding, and using blood thinning medications. Is Osteojuv Safe For Pregnant Women? No. Pregnant women should not take this supplement unless under advice from a caregiver. What Should I Expect When Taking Osteojuv? Like earlier stated, this is a long-term use product and thus you should not expect much. Osteojuv takes up to six months to show any positive results. It takes between a few weeks to six months for users to report positive results. OsteoJuv has two of the most popular ingredients in joint care; Glucosamine and Chondroitin. On paper, it appears to be the answer to nagging joint pain caused by dry joints or arthritis. However, the user reviews are not as positive as if we would have expected. So what might be wrong? The formula used in this product has not been subjected to adequate scientific research. The manufacturer has not even conducted clinical studies that might help us make informed decisions on the working method of OsteoJuv. The product is not recommended for persons who are looking for a fast and effective solution to joint pain.